The PC version features high resolution textures, high quality shadows, tessellation and more PC-specific features while also being fairly well optimized. The OS X version also suffers from multiple issues, one being the complete lack of multiplayer, due to the GameSpy services being shut down. Steam and Rockstar Games Social Club online key verification on launch. Does not unlock a digital download. DLC is loaded through the Rockstar Games Social Club account. 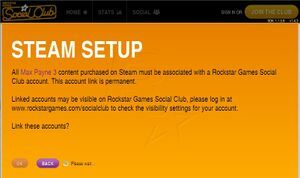 All versions require Rockstar Games Social Club for activation and online features. All Windows versions use GameShield IronWrap DRM. Rockstar have not disclosed details of how many machine activations are allowed nor any other restrictions. Updates for the retail versions can be found here. Letterboxed behavior example (16:10 resolution used). Aspect ratios other than 16:9 are letterboxed in non-engine cutscenes. Cutscenes don't display correctly. Use jackfuste's fix #1 or fix #2 . Default is 45° vertical. See Field of view (FOV). Can also use the -windowed parameter. Low to Very High FXAA and up to 8x MSAA. Alt-tabbing in fullscreen mode may change triple buffering to double buffering. Download Max Payne 3 Cheat Table. Double-click on the file to open in Cheat Engine. Run the game and switch back to Cheat Engine. Click on Open Process and select MaxPayne3.exe. Activate the checkbox beside FOV (F3). Double-click on the value of 70 to change if needed. Weapon zoom and cutscenes are affected; toggle script with F3 when needed. Default FOV is different for certain resolutions lower than FHD. Though the game doesn't use EAX.dll library, Creative Alchemy still can be used to noticeably enhance sound quality, as it restores also DirectSound3D used by the game . It will just emulate DirectSound and 3D positional audio with OpenAl from translated DirectSound calls. For non-Creative cards users see here or use IndirectSound (worse quality, doesn't use OpenAL). dsoal library is incompatible with Max Payne 3 and (at least) with Max Payne 2. Most languages can be forced by using -language Language. For Brazilian Portuguese use -language Portuguese. See Command line arguments. Co-op included in Deathmatch Made In Heaven DLC. OS X multiplayer no longer works. The game must be installed under C:\Program Files (x86)\Steam\Steamapps\Common\Max Payne 3 in order for Social Club to load, which is required to play the game. If the game was installed to a custom Steam folder, there are two methods to solve the issue. It is possible to create a symlink to the folder containing the game, tricking the game into believing it is installed in the correct location. 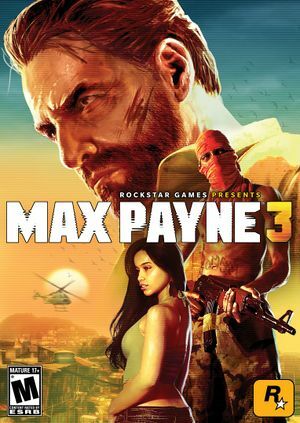 Run the command mklink /D "Max Payne 3" "K:\Games\Steam\steamapps\common\Max Payne 3"
Replacing "K:\Games\Steam\steamapps\common\Max Payne 3" with whatever path you have to your Max Payne 3 installation. Next time you run the game through Steam it will reinstall the prerequisites, and then let you play the game. Ensure the MaxPayne3.exe does NOT have compatibility or Admin rights settings applied. Use the -scdetectproxy steam launch option. Delete the Social Club installation folder (do not use the uninstaller). Install an earlier version of Rockstar Games Social Club such as v1.0.9.7. Run the game and it will tell you to update the Social Club program. Run the installer from Max Payne 3's MP3Installers folder. The game will not launch for many users. This can be fixed by going into safe mode, and changing the game to DirectX 9. Use the -safemode -windowed command line arguments. Game settings > set to DirectX 9, with choice of screen resolution and fullscreen. Remove the command line arguments. Even after the patch which introduced a mouse acceleration toggle, some players experience negative mouse acceleration as well as frame rate dependent sensitivities. There are currently no true fixes for the negative mouse acceleration. Turning off FXAA, MSAA, and vsync may help to make negative mouse acceleration tolerable. Copy ddraw.dll from Windows\System32 folder, or SysWow64 folder (different file size), or just download Custom ddraw.dll changes mouse feeling too. Or maybe not in every case for better. It can be easily tested even in main menu. Not sure if custom libraries don't cause rare falling under map glitch on the airport level, or not loading part 2 of the office level (though SweetFX or dsound.dll can be also culprits). Rinput dosen't work in this game. This error is usually caused by having an Xbox 360 Wireless Network Adapter plugged into USB. This error is related to .NET 3.5. Restarting the computer should fix the error, but if not try reinstalling .Net 3.5 and restarting. Run maxpayne3.exe as an administrator. Ensure Data Execution Prevention (DEP) is set to the default (Windows programs and services only). This error message can be caused on the Steam version of the game when Steam is forced by the OS into compatibility mode. Game may report that video memory is 0/0. This may be caused by older graphics drivers which need updating. For the error message "no activations remaining for this activation key" or "cannot contact activation server  when trying to activate the game over socialclub. Run it as an administrator. Once this is done, the game will activate properly. The game may show the error message 'Requires Service Pack 1 or superior'. This can be fixed by finding the maxpayne3.exe file. Right clicking and setting the compatibility mode to "Windows XP (Service Pack 3)". Running maxpayne3.exe as an administrator may also fix the problem. Asus software 'Smart Doctor' or 'Asus Gamer' may cause crashing. Can be fixed by reinstalling Rockstar Games Social Club before launching. This have to be done every time before launching the game. Also make sure that your internet connection works fine. Problem may also appear during using Android smartphone as modem. When using Steam version, the problem may appear when you run game's executable without Steam enabled. You don't have to fight on stadium with Passos, with enemies searching the balcony (wait till they gone). It's a place with painkillers ahead. IT man will die if you go down the stairs. GameSpy OS X version only. No longer works. Add parameters to a commandline.txt file in the installation folder, or see command line arguments for other methods. adapter Force specific DirectX adapter starting from 0.
aspectratio Force aspect ratio [width:height]. availablevidmem Force Video RAM limit to the amount specified (MB). cpucount Force CPU count if query is not successful. d3dmt Force multi-threaded DirectX runtime. dx10 Force DirectX 10 if available. dx10_1 Force DirectX 10.1 if available. dx11 Force DirectX 11 if available. fxaa Force FXAA quality [0..3]. gpucount Force GPU count if query is not successful. language english Force English language. language french Force French language. language italian Force Italian language. language german Force German language. language spanish Force Spanish language. language russian Force Russian language. language portuguese Force Portuguese language. language polish Force Polish language. MSAAQuality Force MSAA quality level. outputMonitor Force specific monitor starting from 0.
reflectionquality Force reflection quality [0..3]. safemode Force game to load with safest settings. shadowquality Force shadow quality [0..3]. tessellation Force tessellation quality [0..3]. texturefilterquality Force the Anisotropic texture filter quality [0..4]. texturequality Force the texture quality [0..2]. useHighQualityShaders Force usage of high quality shaders [0..1]. waterquality Force water quality [0..2]. To activate, press F4. Press 8 to scroll up, 2 down, 0 to back out, 5 to accept, 6 scroll sideways. If you skip the cutscenes before specific parts (detailed below), the game won't finish loading properly, forcing you to die or reload the checkpoint, ending a NYMHC run. 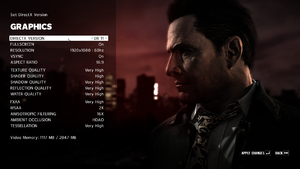 Download Max Payne 3 Script Hook. Copy ScriptHook.dll and dinput8.dll to the game folder. 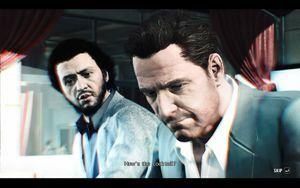 Download Max Payne 3 Skip Cutscenes Script. Extract the .asi script to the game folder. In chapter one, after saving Fabiana, Max will be stuck in the elevator and unable to move. In chapter seven, after the part where Max is hanging in the ascending chain during the warehouse section and before the screen fades to gameplay, you are instantly killed. In chapter eight, right at the end, in the area where Max and Passos emerge from the morgue and have to deal with the guy up on the balcony (the room with the red carpets and curtains), the area fails to load here if you skip the cutscene, forcing you to reload the checkpoint. In chapter nine, when you skip the second scene with the explosion, game is crashing after moving forward. ↑ 1.0 1.1 File/folder structure within this directory reflects the path(s) listed for Windows and/or Steam game data (use Wine regedit to access Windows registry paths). Games with Steam Cloud support may store data in ~/.steam/steam/userdata/<user-id>/204100/ in addition to or instead of this directory. The app ID (204100) may differ in some cases. Treat backslashes as forward slashes. See the glossary page for details. ↑ Rockstar Support on Twitter: "@PalZer0 We don't announce max activations, reset timers, etc. but we can make sure that you can play the game on computers you own. :)"
↑ Steam Community :: Guide :: Max Payne 3 Skip Cutscenes INSTANTLY!